Command® 3ME herbicide remains the South’s number one preemergence solution for protecting rice production from annual grasses despite recent entries into the market, according to FMC tech service rep Don Johnson in Mississippi. 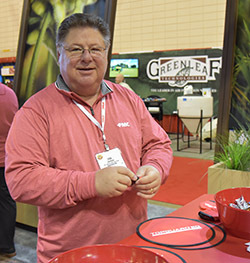 “We’ve been on the marketplace for rice growers in the Delta region for 16 years now,” said Johnson during an interview at the 2017 Farm and Gin Show. The microencapsulated form of clomazone was first introduced by FMC in 1996 to address previous volatility issues. Johnson adds that FMC has another clomazone product for rice growers called Obey which provides effective weed management for Southern rice growers facing increasing pressure from threats like barnyardgrass and hemp sesbania.